Patio pavers are available in a wide variety of shapes, colors, and materials that can be combined to create an almost infinite amount of patterns. For this reason, patios made of pavers can complement almost any type of architecture while expanding the function of the surrounding outdoor space. While construction professionals may debate whether or not brick can be considered a paver, the following materials can be used interchangeably with traditional concrete pavers. For the layperson, a paver should simply refer to a unit that can be used to create a patio or walkway. Brick pavers are a popular choice for homeowners who appreciate the intricate patterns and warmth brick has to offer. Brick pavers can complement many styles of architecture, ranging from the formal to the rustic. Concrete pavers come in broad selection of shapes and sizes. Unlike other materials, the concrete is molded, not cut, to produce individual pavers. For this reason, concrete pavers are often more cost effective than other types of pavers. While almost any stone could be used as a paver, cost and practicality limit commonly-used pavers to several types. Sandstone, limestone, and granite are commonly used for patios and can be cost efficient to use in areas where the stone is quarried. Paver patterns vary widely depending on the patio design being used as well as the aesthetic the homeowner wants to create. Many patio paver designs mimic traditional brick laying patterns. In this pattern, two rectangular pavers are placed together to form a square. The joint between the two pavers is then alternated between the horizontal and the vertical, and the squares are stacked in neat rows. Herringbone is often considered to be a fancy pattern and is found in more traditional designs. It is important, if you choose a herringbone pattern, to make sure the length of the patio paver is exactly double the width of the paver. Pavers without this two to one ratio cannot be laid to create a herringbone pattern. A running bond is one of the simplest patterns to create. In this pattern, pavers are laid in horizontal rows with the vertical joints staggered. For this pattern, rectangular pavers are used to create a large circular design. This can be a difficult pattern to create for the novice, as the gaps between the pavers must be carefully manipulated to create the appropriate shape. Random patterns vary greatly depending on the pavers used. Often several different sizes of pavers are used to help create a random appearance. Multiple paver colors may further highlight the unpredictability of the pattern. Knowing how to build a patio well requires more than the correct pavers. In a well constructed patio, there are four parts: gravel, sand, edging, and pavers. A homeowner who neglects to have adequate gravel and sand beneath the pavers runs the risk of a surface that will shift and even crack over time. Most contractors recommend at least four inches of gravel to create proper drainage underneath the pavers and to prevent vertical shifting. Over that gravel should be at least an inch of bedding sand, to help anchor the pavers. 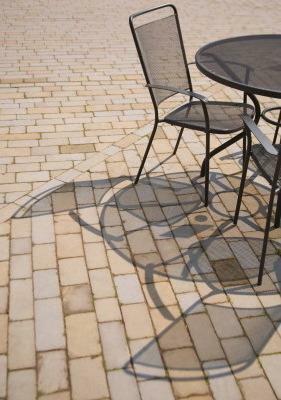 A well set edging will prevent horizontal shifting as well as define your patio's perimeter. Laying pavers is hard work, especially if significant site modifications are involved. If you are planning on constructing a large patio yourself, consider hiring someone to level the area and deliver and spread out the gravel. This will help reduce the substantial manual labor involved when working with patio pavers. Of course you can also hire a contractor to build the entire patio. If you do decide to hire out all of the work, be sure to ask for any patio ideas before starting the project. A professional should be able to recommend patio pavers and designs appropriate to your space, area, and budget.